I’m a third generation Bruja, thanks to my mother and grandmother, and an eternal student of the universe. A lot of people are mortified by the idea of witchcraft. Sure, I guess it could sound somewhat morbid (not to mention strange), but in the end, witchcraft isn’t really a “noun” you can dress up in derogatory adjectives, or even refer to as devil worshiping. Witchcraft is an indescribable essence that slips right out of your hands. It’s energy that’s pure and rich, and especially unique to everyone it possesses. It’s the feeling of sexual arousal combined with a lust for life. It’s love. It’s spirit. It’s strength and universal wisdom. It’s Mother Nature’s whispers as the ocean waves crash against your skin. Nothing is coincidence. It could be something as simple as a pretty flower growing in your backyard, or the sudden need to shake hands with a random stranger. Everything you acknowledge, experience, and welcome into your life is a pure reflection of your infinite spirit. What do you feel when you look at the moon? How do you feel when you’re making love? What makes your blood boil with red-hot passion? That’s where your magic lies. That is witchcraft. My grandmother’s family is from Spain, but this sort of validated my attraction to European cultures; not to mention all things Middle Eastern (especially the music). It was then that I realized the true meaning of both spiritual power and karmic familiarity. My ancestors were always with me, and nothing was, or ever will be, a coincidence. For the record, astrology is a very big part of my life, and I admit, it saved me in so many ways. I was about 12 years old when I found my mother’s Linda Goodman “Star Signs’” book, and that’s honestly all it took for me to become utterly obsessed. I remember seeing the characteristics of each sign, and mentally analyzing the people all around me. I asked every single person what their sign was, and I bet if you knew me then, you remember that clearly. Today, my intuition is stronger than I ever imagined, and my ancestors, spirits and guides communicate with me on a regular basis. I guess you could say, I’m the one sitting at the head of the misa table these days. I’m a third generation Bruja, thanks to my mother and grandmother, and an eternal student of the universe. When I'm not writing, I'm working closely with my clients, as astrology consultations are part of my offerings and services. In the end, I genuinely believe that it is my destiny to empower women and fellow witches, while inspiring strength and authenticity. 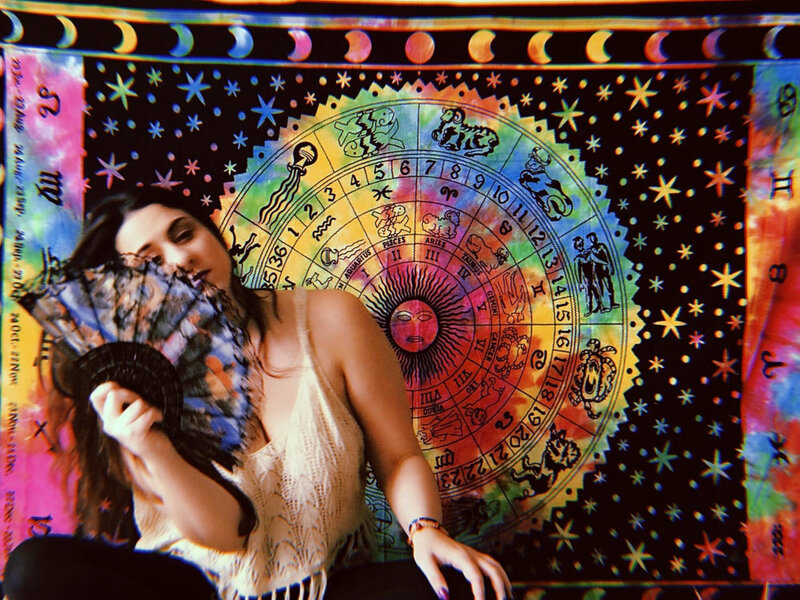 If there’s one thing astrology and witchcraft have in common, it’s that there’s no such thing as another you. Each of us have been blessed with a unique gift, and it’s up to us to trust it. That is real magic. With that being said, pay attention to the energetic themes that surround you. Notice what triggers your emotions. The moment you surrender and begin to embrace your soul’s truth, is the very same moment you start living your best life. Being you is all you need to do. I am unapologetically myself. My ancestors walk with me, and flow through me.